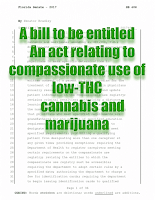 "An act relating to compassionate use of low-THC cannabis and marijuana." 59         act; providing an effective date. 71  cannabis or medical cannabis into the human body. 73  Art. X of the State Constitution. 77  course of that debilitating medical condition. 80  half-blood, by marriage, or by adoption. 85  THC cannabis or medical cannabis pursuant to this section. 89  medical marijuana treatment center a dispensing organization. 105  center from a dispensing organization. 106         (i)(f) “Marijuana” has the same meaning as provided in s.
113  by an eligible patient as defined in s. 499.0295. 117         (k)(g) “Medical use” has the same meaning as provided in s.
122  cannabis or medical cannabis by smoking. 136         a. On any form of public transportation. 137         b. In any public place. 139  if restricted by his or her employer. 140         d. In a state correctional institution as defined in s.
141  944.02 or a correctional institution as defined in s. 944.241. 144         f. On a school bus or in a vehicle, aircraft, or motorboat. 147  includes eligible patients, as that term is defined in s.
155  medical cannabis from a dispensing organization. 183  assist with device for the patient’s medical use of marijuana. 241  written informed consent as defined in and required by s.
244  qualifying patient pursuant to paragraph (c). 281  defined in s. 499.0295. 290  of the first degree, punishable as provided in s. 775.082 or s.
298  misdemeanor of the first degree, punishable as provided in s.
299  775.082 or s. 775.083. 303  degree, punishable as provided in s. 775.082 or s. 775.083. 309  first degree, punishable as provided in s. 775.082 or s.
317  disciplinary action under the applicable practice act and s.
345  the requirements of this paragraph. 354  cannabis, and cannabis delivery devices. 362  physician renews his or her license. 367  applicable practice act and under s. 456.072(1)(k). 400  the hospice or licensed facility. 405  requirements of this subsection and department rule. 501  central Florida, southeast Florida, and southwest Florida. 508  member of the Black Farmers and Agriculturalists Association. 516  requirements established in this section and by department rule. 526  Department of Agriculture and Consumer Services pursuant to s.
530  at least 30 continuous years. 540  statewide or regionally as determined by the department. 547  is only required to maintain a $2 million performance bond. 552  activities of the MMTC dispensing organization. 556  applicant that is a recognized class member of Pigford v.
566  or medical cannabis to, another MMTC dispensing organization. 573  devices device and take disciplinary action as indicated. 591  standard than the specific representation in the application. 598  restricted-use pesticides pursuant to s. 487.042. 607  implement and maintain phytosanitary policies and procedures. 610  accordance with chapter 581 and any rules adopted thereunder. 615  from other plants or products. 639  Packaging Act of 1970, 15 U.S.C. ss. 1471 et seq. 651  cannabidiol in the product. 654  pursuant to the audit required under subparagraph 2. 660  patient or caregiver the patient’s legal representative. 673  delivery device for the patient. 676  THC cannabis or marijuana. 690  size and the amount of THC in each serving. 695  the registry, and the order has not already been filled. 727  45 days, or longer upon the request of a law enforcement agency. 729  have sufficient lighting from dusk until dawn. 737  stolen, diverted, or lost. 745  a secured, locked room or a vault. 748  premises at all times. 750  identification badge at all times while on the premises. 752  times while on the premises. 753         9. Implement an alcohol and drug-free workplace policy. 756  of marijuana low-THC cannabis or medical cannabis. 763  the vehicle at all times when transporting marijuana. 765  transport marijuana low-THC cannabis or medical cannabis. 767  separate compartment or container within the vehicle. 786  adverse effect to human health or the environment. 797  for screening applicants’ criminal and financial histories. 806  department under this section. 810  and medical directors publicly available on its website. 818  patient or legal representative. 826  such person in the department’s compassionate use registry. 833         7. Be resistant to counterfeiting or tampering. 837         1. Violating this section, s. 499.0295, or department rule. 843  information of a qualifying the qualified patient. 846  fraudulent misrepresentation, or extortion. 853  dispensing organization knows to be false. 855  section or department rule. 864  MMTC a dispensing organization. 874  subpoena of the department or an agency of the state. 883  requirements of this section and pays the biennial renewal fee. 889  by MMTCs dispensing organizations are preempted to the state. 899  unincorporated areas of that county. 911  physician’s certification ordered for the qualifying patient. 919  THC cannabis, medical cannabis, or a cannabis delivery device. 922  same meanings as provided in s. 893.02. 927  THC cannabis or medical cannabis as provided by department rule. 934  medical cannabis, or a cannabis delivery device. 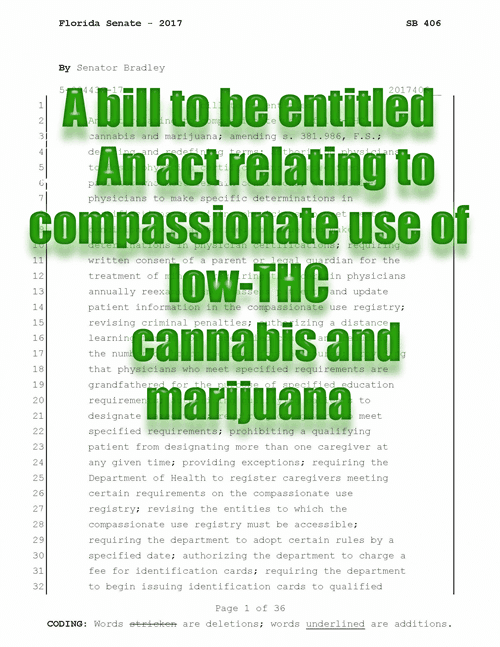 939  medical cannabis or low-THC cannabis under Florida law. 949  other test to detect the presence of a controlled substance. 965  for the person attempting to have it filled. 973  dispensing organization as defined in s. 381.986. 985  medical cannabis, and cannabis delivery devices. 995  by an MMTC a dispensing organization. 997  organization registered with the Department of Health under s.
1004  device available under this section. 1007  an eligible patient without receiving compensation. 1011  defined in s. 381.986. 1019  dispensing organization as defined in s. 381.986. 1024         Section 7. This act shall take effect upon becoming a law.